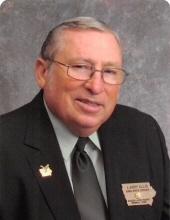 Larry Ellis, age 80 of Grinnell, died on Friday, March 22, 2019 at Accura Healthcare in Newton. A memorial service with military rites will be held at 10:30 a.m. on Tuesday, April 2, 2019 at the Smith Funeral Home in Grinnell with Rev. John Epperson, Grinnell Regional Hospice Chaplain, officiating. A reception will follow at the Eagles in Grinnell. Visitation will begin at 2:00 p.m. on Monday at the Smith Funeral Home and his family will receive friends from 5:00 p.m. until 7:00 p.m.
Memorials may be designated to the Larry Ellis Memorial Fund, mailed in care of the Smith Funeral Home, PO Box 368, Grinnell, Iowa 50112. Memories and condolences may be shared with his family online at www.smithfh.com. Larry Lee Ellis was born the son of Percy and Jeanette (Coonrod) Ellis on October 11, 1939 in Grinnell, Iowa. He was raised in Grinnell and graduated from Grinnell High School with the class of 1957. He honorably served his country as a Staff Sergeant in the United States Army from 1958 until 1967. Larry was united in marriage to Penny Briggs in 1960 at St. Mary Catholic Church in Grinnell. To this union they were blessed with a daughter, Christina. Their marriage later ended in divorce. In 1966, Larry was married to Dorothy Kroenke in Grinnell. They resided in Grinnell all of their married lives and Larry was a longtime employee at Grinnell Beverage (Budweiser) and later was a custodian at the Grinnell High School. He was an auxiliary officer at the Grinnell Police Department for twenty years. Larry was very active with the Eagles in Grinnell and was past president and past state president. He and Dorothy traveled to many national, state and local Eagles events. He was a member of the Grinnell Veterans Ceremonial Unit, who provided military rites at many veterans’ funeral services. He was an avid golfer, bowler and fast-pitch softball player. His enjoyments were attending his grandsons’ sporting events, fishing, watching the Green Bay Packers games on TV, and going for motorcycle rides with Dorothy. He will be remembered for being a great husband, father and grandfather, for his dedication to the Eagles, and for his sense of humor. Larry is survived by his daughter, Christina Goodrich of Brooklyn, Iowa; four grandsons, Justin (Bethany) Goodrich of Ladora and their daughter, Emery, Matthew Goodrich of Brooklyn, Zachary Goodrich of Brooklyn, and Charlie Goodrich of Brooklyn; and nephew, Don Ellis of Grinnell and his children, Donnie and Stacy, both of Grinnell. Great-Great nephews Noah Beal, Christopher Beal, Brady Ellis, Maxwell Ellis, all of Grinnell. Great-Great niece Mackenzie Ellis of Montezuma. He was preceded in death by his parents; brother, Don Ellis in 1999; wife, Dorothy in 2019; niece, Penny McDonald in 2004; and nephew, Paul Scott in 2001. To send flowers or a remembrance gift to the family of Larry Ellis, please visit our Tribute Store. The family will receive friends from 5:00 p.m. until 7:00 p.m.
"Email Address" would like to share the life celebration of Larry Ellis. Click on the "link" to go to share a favorite memory or leave a condolence message for the family.